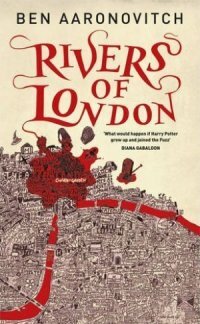 Last week, I read an urban fantasy novel, Ben Aaronovitch’s Rivers of London (released in the US as Midnight Riot), about a modern London constable who becomes apprentice to the last sorcerer on the force. The very next day, I read its sequel, Moon over Soho. And the day after that, I read the third in the series, Whispers Under Ground. Three books in three days – they’re that good! And that addictive. To start, I should get my one criticism of these books out of the way: their plots do not hang together very well, with Rivers of London being the most egregious offender. However, Aaronovitch writes with such exuberance that I can forgive him the wayward plots. What does he do right? That’s a longer list. Tone and narrative voice. The wisecracking first-person narrator has been around a while, but rarely is he as laugh-out-loud funny as he is in these books. Yet the books are just as effective with their fight scenes, and their outright ‘oh crap’ moments. Theme. These are not books about some chosen one who surpasses his master after 30 seconds of training montage. They’re not about triumph by having the right parents or the fanciest gadgets. They’re about the triumph of an everyman hero, an apprentice who defeats supernatural horrors with grit and ingenuity. Characters. I could rave to you about how charming and amusing they are, but the real trick of Aaronovitch’s characterisation is the depth he buries beneath their quirks. The melancholy behind the well-groomed exterior. The sadness underlying a drunken proposal. Or conversely, the childlike joy displayed by a particularly hardbitten soul who sees evidence of magic; or the moments when the characters show their courage and resilience.